ADI and AnimaNaturalis Internacional have condemned ‘The Hundred-Year-Old Man’ for its use of an abused circus elephant. The film is directed by Felix Herngren and opens in cinemas across Spain on 11th July. ’The Hundred-Year-Old Man bills itself as a comedy but there is nothing funny about the shocking abuse of the poor elephant who features in it. 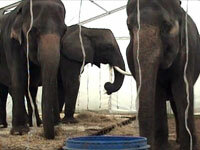 Experts agree that the use of wild animals in the entertainment industry causes suffering.